Disposing of pharmaceuticals properly is critical- not only is pharmaceutical waste regulated by state and federal laws, there’s a huge risk of harmful medications affecting the environment. 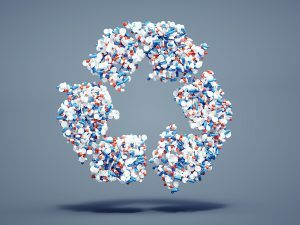 It doesn’t matter if you’re a healthcare facility, hospital, or retail pharmacy, or even if you’re disposing of expired medications at home- there are certain precautions that need to be taken to ensure your organization is complaint and not affecting their environment with improper pharmaceutical waste disposal. Medical Waste Pros can help ensure your company is compliant and that you have the proper program in place with the amount of pharmaceutical waste you produce. We’ll provide you with containers, schedule a regular pickup or set up your mail-back service, and eliminate the risk of harmful medications affecting your patients, staff, and the environment. To get started, give us a call at (888) 755-6370 or fill out the form to the right! What is Hazardous Pharmaceutical Waste, and How Do I Manage It Properly? Any expired pharmaceuticals or other pharmaceutical waste is going to be regulated by Environmental Protection Agency along with your State Health Department. The things in pharmaceuticals that help people can be just as hazardous to the environment. Since most medicines are high concentrations, and those concentrations generally don’t degrade over time, there’s a tremendous danger if they’re not disposed of properly. It contains ingredient(s) that result in the pharmaceutical exhibiting characteristics of hazardous waste (ignitable, corrosive, reactive/explosive, or toxic/radioactive), which requires that it be treated as hazardous waste under RCRA. The material is already regulated by your state environmental agency. If any or all of these items apply, you should take the proper steps to ensure you are disposing of it properly. That’s where Medical Waste Pros can help! Medical Waste Pros will help you find the right system and schedule that works for your organization. If you need to dispose of pharmaceuticals on a regular schedule, or just need periodic on-call pickup, we can find a local provider to help you. Hospitals– Including managing pharmaceutical waste in any hospital setting, surgery centers, laboratories, blood banks and more. Clinics – Do you have a retail clinic or do you run a private practice? Learn how we can help manager your medical waste and pharmaceutical waste efficiently and affordably. 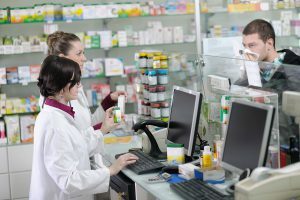 Pharmacies– Our experts can help retail pharmacies and pharmaceutical companies with easy-to-manage systems to ensure expired medications are disposed of properly. Long-Term Care/Hospice Facilities– There are several unique aspects that are involved in long-term care pharmaceutical disposal- we make sure you understand what you need to help protect your employees and residents. We also serve Veterinarians, Dentists, and Research facilities to help them strengthen their compliance efforts and protect their employees from harm. Pharmacists must comply with the Medication Management Standards mandated by the Joint Commission. Is my Organization At Risk? To remain in compliance, you need to be vigilant- there’s several telltale signs that your organization might be at risk for improperly disposing of pharmaceuticals. If you ask employees about the details of your pharmaceutical waste disposal program, would they be able to tell you? The most common violation is improper or inefficient training, which leads to mislabeling or mishandling. Are you disposing of unused liquid or any other pharmaceuticals by flushing them down the drain (also known as sewering)? Knowingly dumping hazardous waste can actually result in jail time! Have you been diligent to ensure that pharmaceuticals listed by RCRA aren’t being mixed with other nonhazardous materials? One violation can lead to heavy fines. Do you have an emergency contingency plan in place? What happens if disaster strikes? Medical Waste Pros can help you develop a program that ensures you comply with all required regulations, and even assist you in finding a professional medical waste disposal company right in your area to help you with training and proper medical and prescription disposal management. We’ll help you select the containers, schedule, and system that works best for your organization. To get free quotes on common medical waste disposal, fill out the form to the right, or give us a call at (888) 755-6370.